Microsoft Office Excel widely uses in our community. It is a common use as a simulation of spreadsheets paper. This is a part of automation in our office works as widely use in the calculation. There are hundreds of formulas built-in in this program to meet our needs in our worksheets of data, from simple to more complex application of a formula such as the logical. This is common to the programming platform of computer from basics to advance such as the coding of the database. Logical function is a form of different conditions itself to meet an exact decision of data without changing its reference data in a worksheet. 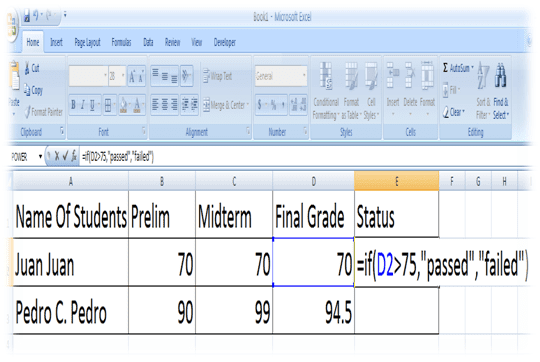 It can decides even it is hundreds of range of data in a single worksheet using the autofill. It can decides even nested in different logical operators both addition, subtraction, division, and multiplication. Now this post will help you learn what is the IF function of the Microsoft Excel using even it is Excel 97, 2003, or 2007 buildup and even using the other Office Application such as Open Office and Star Office. Or else using the cloud application of both the Google Drive spreadsheets and the Skydrive application of the Microsoft Outlook.com of the MSN. Syntax IF (logical_test, value_if_true, value_if_false) Logical_test is any value or expression that can be evaluated to TRUE or FALSE. For example, A10=100 is a logical expression; if the value in cell A10 is equal to 100, the expression evaluates to TRUE. Otherwise, the expression evaluates to FALSE. This argument can use any comparison calculation operator. Value_if_true is the value that is returned if logical_test is TRUE. For example, if this argument is the text string "Within budget" and the logical_test argument evaluates to TRUE, then the IF function displays the text "Within budget". If logical_test is TRUE and value_if_true is blank, this argument returns 0 (zero). To display the word TRUE, use the logical value TRUE for this argument. Value_if_true can be another formula. The syntax above states that IF (logical_test, value_if_true, value_if_false), now basing the worksheet table the remarks are only passed or failed. Combining the logical as stated I use the logical by writing it in the worksheet as follows; =if (d2>75,”passed”,”failed”) now it is understood that =if is a logical function, d2 is a logical reference or reference data, greater than 75 is a logical test, and both using the double quotation the passed and failed is the logical condition that will base of the data reference and will depend of the logical test you provided. See the image shown above. Nice worksheet works thank you for your visits here, can you share your other works?